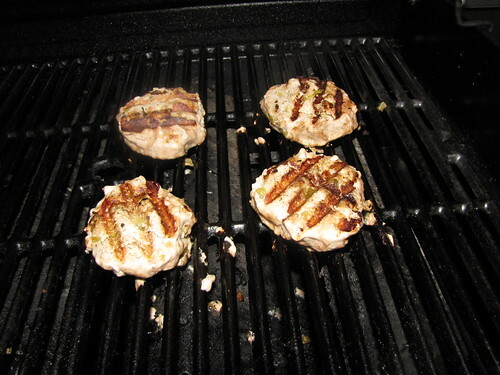 These Green Chile Turkey Burgers were something of a revelation to me. The revelation that turkey burgers do NOT have to be dry, lifeless, hockey pucks on a bun. The picture doesn’t do these justice. 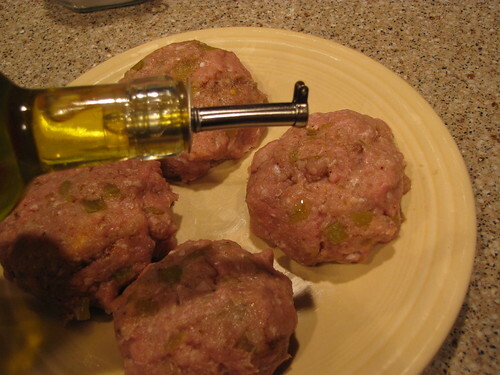 These turkey burgers are juicy. 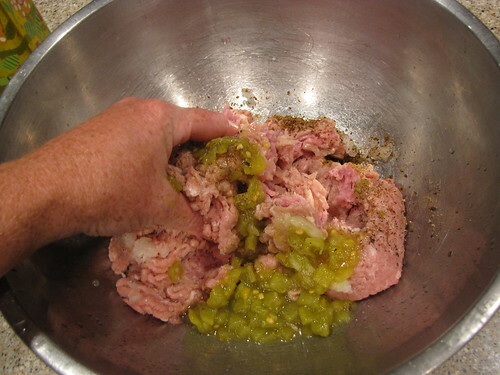 The green chiles not only provide great flavor but they give much needed moisture to the ground turkey. 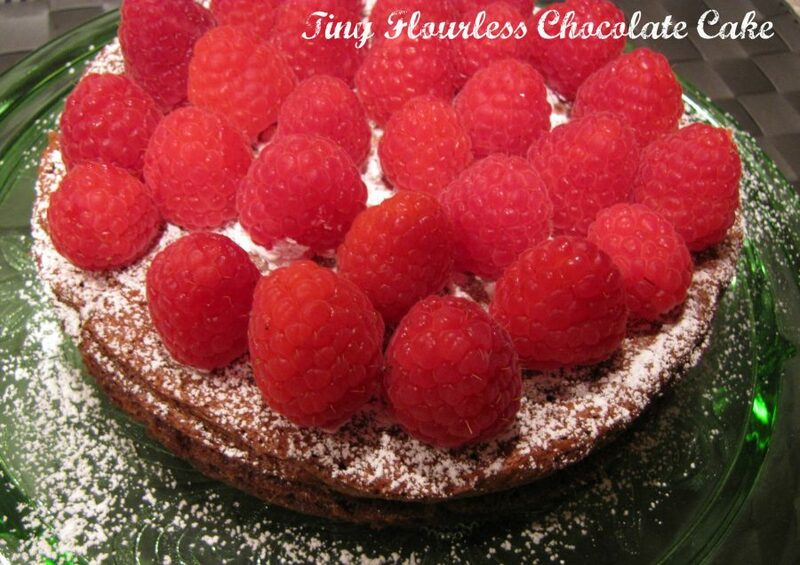 They’re easy to make with just a few simple ingredients. 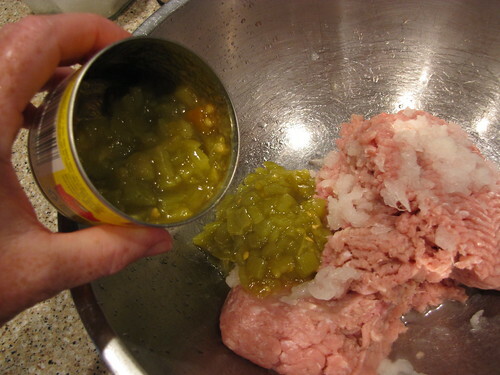 Ground Turkey, Onion, Green Chiles, Cumin, Chili Powder, Olive Oil, Salt & Pepper. Buns, Cheese, and other burger toppings like lettuce and tomato are all good ideas. I have a package of ground dark meat turkey. The package was approximately 1.25 pounds and made 4 nice sized burgers. You could use the all white meat turkey, but to be honest, I’ve found that it just doesn’t have enough fat and flavor to keep the burgers from drying out. Grate 1/4 of a medium onion into the turkey meat. 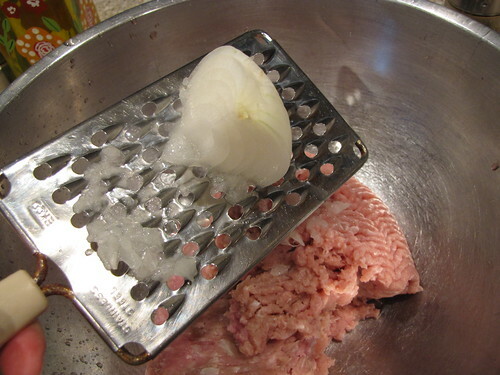 We’re grating to maximize the moisture that comes out of the onion and also help it blend into the turkey. Add about 1/2 of a can (4.5 ounce) of green chiles. Don’t add the whole can or the burgers will be way too wet. 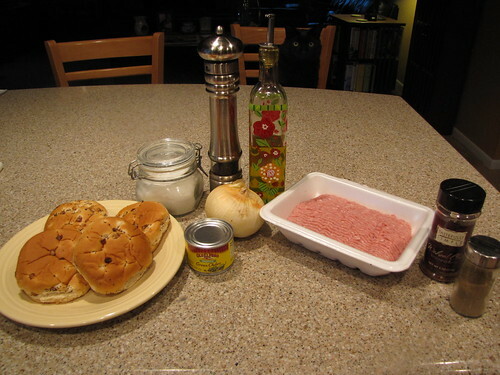 I mixed the other half of the can with a few tablespoons of mayo for a quick and tasty burger topping. Oh, and if you’re worried about green chiles being spicy…don’t. I’m sort of a wimp and I can eat these right out of the can. Not spicy at all…just lots of great flavor. Season the meat with 1 Tablespoon chili powder, 1 Tablespoon Cumin, and salt & pepper to taste. Get right in there with your clean hands and work the meat, chiles, and all of the seasonings together. 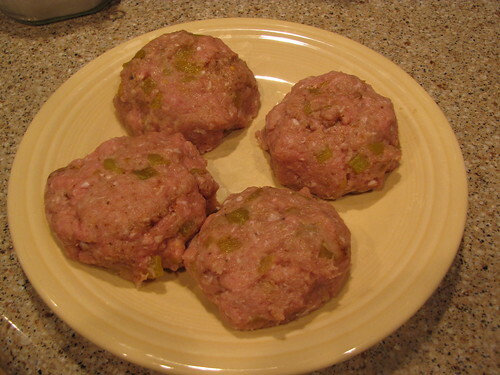 Divide the meat into 4 equal parts and shape it into patties. These will be quite a bit wetter than regular hamburgers but will hold together once they start cooking. Because this is so moist, it is also quite sticky. 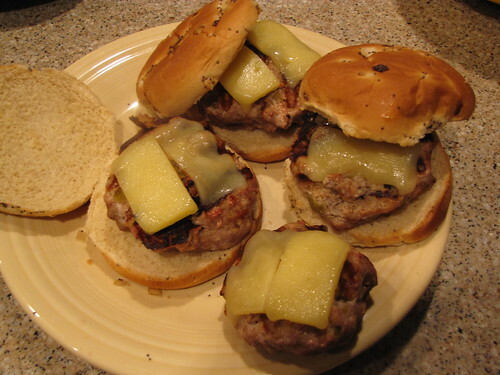 Drizzle a little olive oil over the top of each burger and grease your grill grate like crazy. 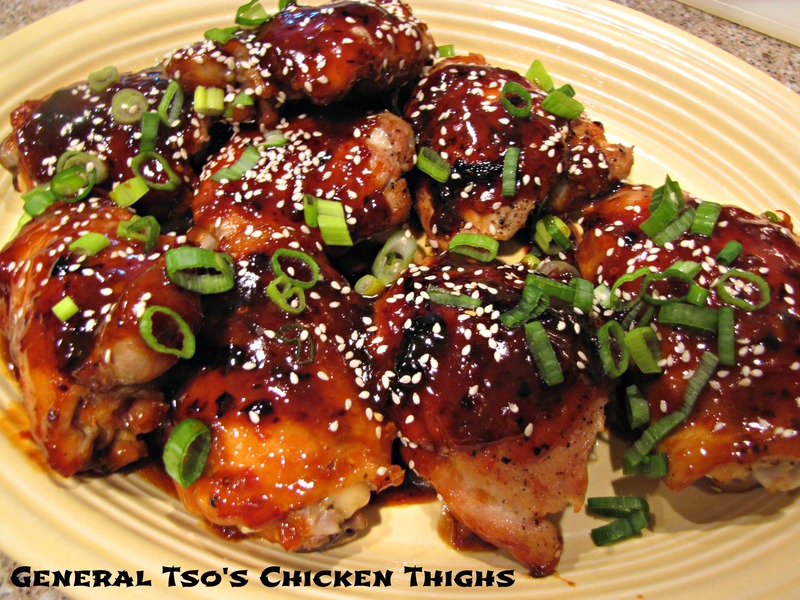 Cook these over medium heat on an outdoor grill, in a pan on the stove top, or under the oven broiler. Because it’s turkey, there is no such thing as medium rare. Be SURE these cook all the way through. You’ll notice that even with the extra bit of olive oil and a good coating on my grill, these still stuck a little bit. You can help prevent this by not messing with the burgers once you put them on the grill. Let them cook until thoroughly browned on one side before attempting to turn them over. Depending on the heat of your grill, these should take between 15 and 20 minutes to cook through. Add some cheese! Toast some buns! Maybe a little side of guacamole to fit the southwest theme. 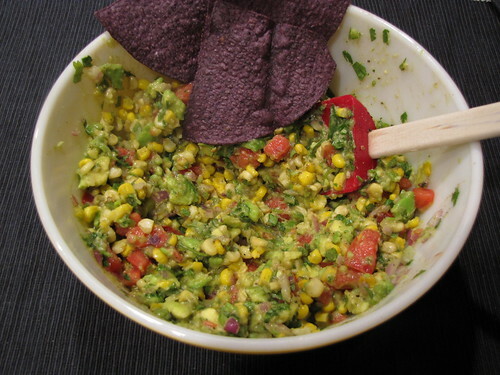 I’ve made Roasted Corn Guacamole blending the roasted corn topping for this amazing Fresh Corn Chowder with my regular Guacamole recipe. Delicious. Add a slice of nice fresh tomato. Maybe some lettuce or baby arugula if you have it. Slather the bun with some of the green chile mayo and you’re good to go. Turkey Burgers are a nice change of pace from the usual hamburger. 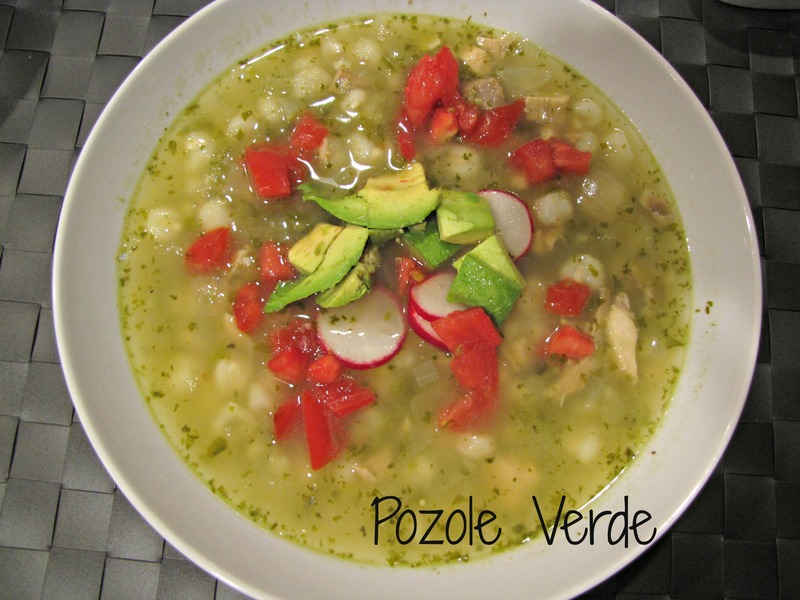 Add a little Green Chile zip to your next tailgate or cookout! where is the take away button???? I just want to order some and have them delivered. 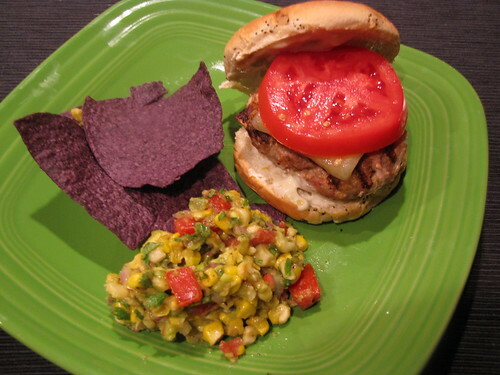 We love turkey burgers…..this is a great flavor option, and I’ll be trying it. 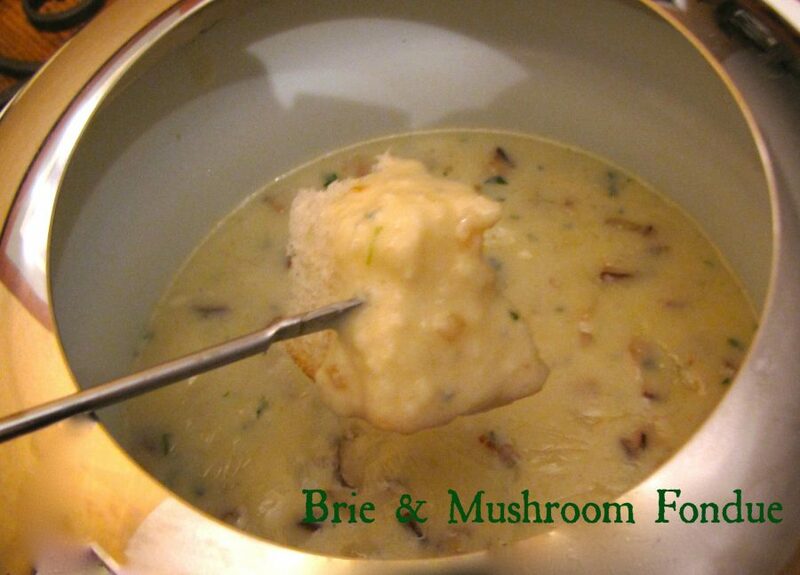 I usually just add shrooms and some cream of shroom soup too. But your’s looks spicier! YUM!